A search for "iphone-5" on apple.com conducted on Wednesday returned results for a number of pages that do not currently exist. Among them is a link to an inactive press release with a date of Sept. 12 named "Apple Introduces iPhone 5." Another URL shows a "tips" article that will be located in a new iPhone 5 section of Apple's website. 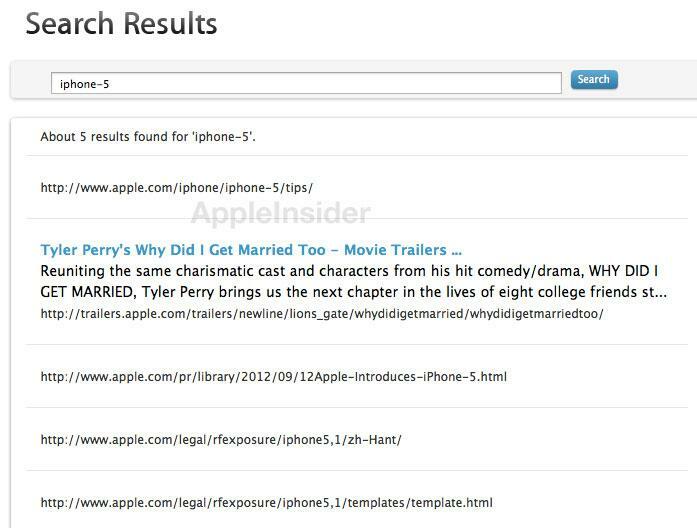 Two more legal documents are included among the search results with the name "iphone5,1" included in the URL. And a search for "iphone-LTE" suggests that 4G LTE connectivity will be included in the new handset. The iPhone 5 name was hinted at last week, when the company sent out invitations for the event. In the invitations, the number 12, representing the Sept. 12 date, casts a shadow in the shape of the number 5. Searching the date "2012/09/12Apple" also returns a link to an inactive press release with the name "Apple Unveils New iTunes," suggesting the software will be given a major update at today's event. Finally, it was also discovered that searching "new iPod touch" returns references to a press release entitled "Apple Introduces New iPod touch, iPod nano." Last year, a mistaken update to Apple's online store in Japan similarly outed the name of the iPhone 4S prior to its official unveiling. Prior to that, many had expected the device would be known as the iPhone 5, but it now appears Apple saved that name for its 2012 model. The new iPhone, iPod touch, iPod nano and iTunes are all expected to be unveiled by Apple at its media event today at the Yerba Buena Center for the Arts in San Francisco, Calif. The keynote presentation will kick off at 10 a.m. Pacific, 1 p.m. Eastern, and AppleInsider will have full, live coverage.